While the show does begin as a sort of new age “The Cosby Show” with a middle class, honest, loving African American family, its premiere on TGIF on the ABC network here in America was pretty boring. And I think after a while even ABC began to realize that deep down this was just a lackluster and forgettable retread of “The Cosby Show” that tried its best to muster up interesting characters and storylines and bombed big time. The series begins without the presence of Urkel and derives little to no laughs and severe eye rolls to the point where there should be a warning for viewers. I mean what was so interesting about these characters? We had the obligatory wise old grandparent, the spunky daughter, the spunky older daughter, the obvious baby for cute points, the sassy aunt (who happens to have once been a part of an R&B group to pander to the older audience members), the horny–but not overly sexual older brother, and the mom and dad who were wise beyond their years. The series today has no value other than that of the nostalgic, and for people willing to recollect the hazy days of the early nineties they may enjoy this on some level. As the writers soon began to realize that the show is very bland and dull, they brought aboard the classic sitcom cliché: the annoying neighbor. And comedy history was made in a near instance. Steve Urkel is a happy accident, a character who was a hybrid of Skippy from “Family Ties” and Ed Norton from “The Honeymooners.” Urkel went from annoying plot element, to supporting character, to gimmicky supporting character, to main character, to just an all around go to for ridiculous storylines over the course of the show’s run and soon every individual in the series relied on storylines revolving around Urkel and his mission to… do something involving science and to win Laura Winslow over for purposes that aren’t explained either. Did he want to sleep with her? Did he want to marry her? Who knows? He’s just a plot device that found life through these one dimensional sitcom clichés who stumbled around doing nothing interesting, and even on the box for the DVD of the first season, Urkel takes center stage, because there’s nothing else about this show that you’ll enjoy. What we learn in the first part of season one is that Laura is having a hard time in school, Eddie has a politically correct white best friend, the youngest daughter is only around to react to other people in the show and eventually disappears, and the dad is a spastic police officer. Talented character actor Reginald VelJohnson relied on his cop motif (from “Die Hard”) to take the reigns of Carl Winslow who eventually became the Ralph Kramden to Urkel’s Norton. So whenever Urkel wrecked something, Carl was just there to react in over the top ways like throwing him out and screaming angrily at his insanity. Like Jackie Gleason, sans the brilliance. 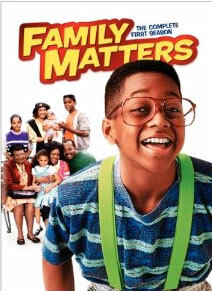 Ultimately “Family Matters” is only relevant because it’s now a passing joke from the nineties, and if you’re in to relics of a sub-par family sitcom starring a walking aneurysm than this set is for you. This entry was posted in Collector's Den and tagged Comedy, Family, Kids, TV Show. Bookmark the permalink.